Wednesday 10th April – Australian Market Wrap | Beeks Downunder-Because not all financial news is boring! Another lacklustre day as the index slipped from negative to positive with a flat performance with the ASX 200 closing up 2 points to 6224 on low volume. Dow Futures +29. All the talk today was on CWN with Wynn Resorts walking away and the stock falling 9.1%. Could have been worse as clearly there are still some hoping for another tilt either from Wynn or another party. Plenty more to come on this one. Resources were slightly weaker today as profit taking hurt sentiment and the IMF growth forecasts weighed on mining stocks. BHP down 0.35 % and FMG down 0.37%. Energy stocks sagged on oil price falls led by WPL down 1%. In brighter news, the banks improved today, a nice change from the recent playbook. MQG up 0.15% and CBA up 0.7% in the big four, helped the index. Defensives were back in favour as the market de-risks slightly. REITs caught a bid with GMG up 1.54%. Other defensives like TCL also rose with the toll operator up again by 0.8%. In economic news, deputy governor Guy Debelle, said the RBA was closely monitoring rising levels of negative equity in households. He added it expected ‘decent’ economic growth over the next few months. Australian dollar formed slightly to 71.44c. US results season now coming into focus. ECB and Fed minutes tonight. ASX 200 up 2 to 6224. Low conviction trading. High 6236 Low 6199. 6200 holds again. Banks hold the line as resources fall. Defensives better with gold in focus. Aussie Gold stronger to $1823. Asian markets mixed with Japan down 0.69% and China up 0.19%. IDEA OF THE DAY – Momentum is fading but we’re still dancing for the time being. BUY HOLD SELL – James Hardie (JHX): Signs of improvement and cost-cutting has us interested but some caution is still required. HENRY’S TAKE – Up 75% in ADT and time to take some profits (maybe). CAT too doing well and maybe a chance to take some money off the table. A few thoughts on CWN and strategies in a takeover fight. Things have changed but there are always stumbles along the way. The path of true corporate love never did run smooth. CWN -9.11% Wynn pulls bid SGR -1.57% too. NEA +3.39% tech stock buying. PNV +6.79% biotechs in favour. SBM +1.82% SLR +4.40% gold producers find friends. DMP +1.58% buys Danish franchise. LYC -0.94% WA says it is open to a plant. LVT +1.79% ARR hits $34.5m up 208% YoY. Speculative Stock of the Day: Nothing on any volume. Biggest Rises: NCM, AZJ, TPM, WHC, QUB, HVN and APT. Biggest Falls: CWN, SPK, JHG, S32, ALL, OSH and AWC. Crown Resorts (CWN) – Wynn Resorts have pulled the pin on “all discussions with Crown Resorts concerning any transaction” following the “premature” leak of preliminary negotiations yesterday. Michael Hill International (MHJ) – Trading update – Total sales up 0.8% YoY to $118.5m with same store sales up 1.5% YoY following the implementation of the new integrates customer-led retail operating model. Gross margin for the first 9 months is 62.1%, down from 62.7% a year ago. E-commerce sales are up 53% YoY to $12.5m and now make up 2.9% of total sales. Seven West Media (SWM) – finalise the sale of a 50% stake in Yahoo7 to Verizon’s Oath for $20.75m. Dominos (DMP) – acquire franchise rights in Denmark for 2.5m Euros and will restart operations in the country within the next 12 months. The company expects Denmark can support 150 stores and help raise the future store count in Europe to 2,850. The deal will not be material to FY19 underlying earnings. The Westpac-Melbourne Institute index of consumer sentiment gained 1.9% this month, up to 100.7. Westpac’s chief economist Bill Evans said that despite a fairly benign monthly gain the survey showed that the Budget was generally well-received. Individuals surveyed after the budget gave responses 7.7% higher than those surveyed pre-budget. 2-Year bond yields +1 bps to 1.48%. 5-Year yields UNCH at 1.50%. 10-Year yields -2 bps to 1.87%. Japan machinery orders rise below expectations. Producer prices lift. PPI lifted by 1.3% year-on-year in March 2019, climbing from a 0.8% increase in the previous month and above market expectations of 1.1%. Core machinery orders in Japan, increased 1.8% month-over-month in February, below market expectations of a 2.5% climb. 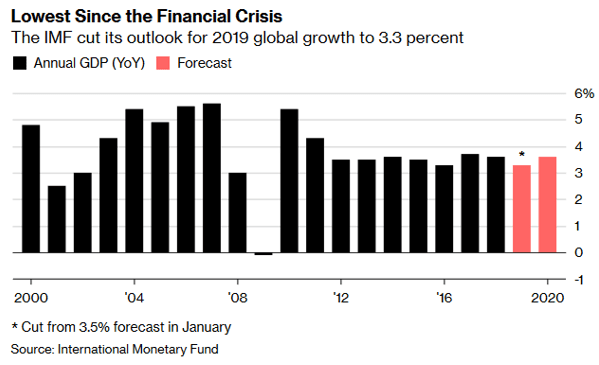 The world economy will grow 3.3% this year, down from the 3.5% the IMF had forecast for 2019 in January. The fund cut its forecast for U.S. growth to 2.3% this year, down 0.2% since the IMF’s last global outlook in January. And finally…………keep the jokes coming..always like some original material..
Amazingly I had an email from a joke web site that I use fro my gags asking for credit and a redirect to the web site…seems someone is reading this after all.